Robotics controllers will command the Canadarm2 to uninstall Dragon from Harmony on Saturday afternoon then slowly maneuver the U.S. space freighter to its release position. The Canadarm2 will then be commanded to release Dragon Sunday at 3:36 a.m. EST as astronaut Anne McClain monitors from the cupola. NASA TV will broadcast the departure live without commentary starting Sunday at 3:15 a.m.
Today, the three space station residents are back on science and maintenance duties with Dragon poised for a weekend departure. McClain of NASA is checking out and preserving the space research meant for return inside Dragon. Flight Engineer David Saint-Jacques of the Canadian Space Agencyassisted McClain first thing Thursday morning. He then moved on to the Vascular Echo study scanning his leg’s femoral artery with an ultrasound device to understand how living in space affects the cardiovascular system. Cosmonaut Oleg Kononenko explored ways to improve piloting techniques in space and participated in a psychological assessment. The four-time station resident also maintained Russian life support systems aboard the orbital lab. Back on Earth, NASA and SpaceX are continuing to work on the activities leading toward the Demo-1, uncrewed flight test to the International Space Station. NASA and SpaceX are now targeting no earlier than February for the launch of Demo-1 to complete hardware testing and joint reviews. NASA and SpaceX will confirm a new target date after coordination with the Eastern Range and the International Space Station Program. The SpaceX Dragon cargo craft is pictured attached to the International Space Station’s Harmony module as the orbital complex flew 258 miles above the Indian Ocean off the eastern coast of South Africa. To take advantage of calmer sea states in a different location in the Pacific Ocean, SpaceX and the International Space Station Program agreed to move the departure of the SpaceX-CRS-16 Dragon cargo craft from the station from early Sunday morning to late Sunday afternoon, setting up the first night splashdown and recovery of a Dragon vehicle. Dragon’s hatch will be closed Sunday morning, and the spacecraft will be detached from the Harmony module around 3 p.m. EST Sunday. 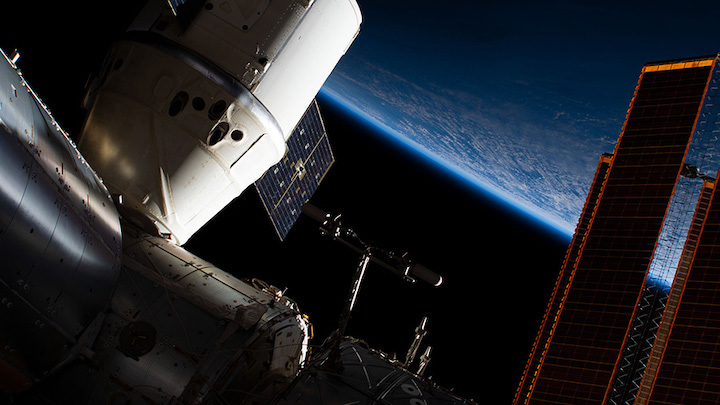 Ground controllers will now release Dragon from the Canadarm2 robotic arm at 6:30 p.m. Sunday. NASA TV coverage of the operation without commentary will begin at 6:15 p.m. NASA Flight Engineer Anne McClainwill monitor the release from the station’s cupola. Dragon’s deorbit burn to begin its descent back to Earth is now scheduled at approximately 11:19 p.m. with splashdown scheduled at around 12:10 a.m. Monday (9:10 p.m. Pacific time) just west of Baja California. The unpiloted supply ship, loaded with about 2 tons of gear and experiment specimens, departed the space station at 6:33 p.m. EST (2333 GMT) Sunday with a ground-commanded release from the orbiting research lab’s 58-foot (17.7-meter) Canadian-built robotic arm. The Dragon capsule fired its thrusters for a series of departure burns to fly away from the station’s vicinity, setting up for a deorbit burn at 11:19 p.m. EST (0419 GMT) to slow the craft’s velocity enough to drop out of orbit and re-enter Earth’s atmosphere. Soon after completing the braking burn, the Dragon spacecraft jettisoned its disposable trunk section, which is designed to burn up in the atmosphere. The pressurized section of Dragon, meanwhile, plunged back to Earth protected by a heat shield, then deployed a series of parachutes to slow down for splashdown in the Pacific Ocean southeast of Guadalupe Island, off the west coast of Baja California. SpaceX confirmed a successful splashdown in a tweet at 9:12 p.m. PST Sunday (12:12 a.m. EST; 0512 GMT Monday), wrapping up the company’s 16th Dragon resupply mission to the International Space Station since 2012. NASA’s contract with SpaceX is valued at $3.04 billion for 20 cargo missions to the space station from 2012 through next year. 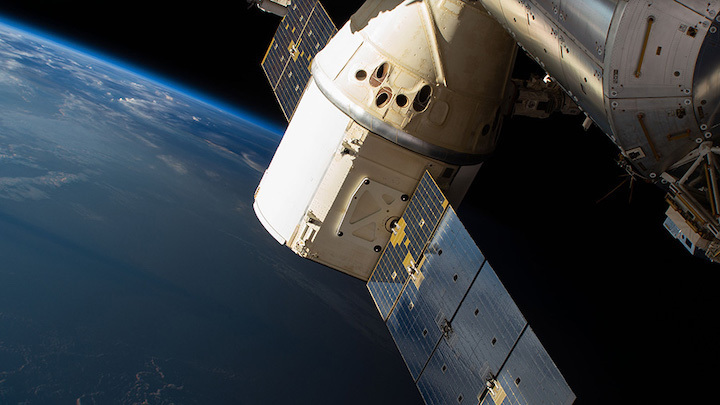 Another NASA contract guarantees SpaceX at least six additional resupply missions to the station through 2024, for an unspecified amount. The Dragon cargo capsule launched Dec. 5 from Cape Canaveral Air Force Station in Florida aboard a SpaceX Falcon 9 rocket, and the spaceship completed an automated rendezvous with the space station Dec. 8 to deliver 5,673 pounds (2,573 kilograms) of provisions and experiments. The cargo delivery included 40 mice sent to the space station to study the effects of microgravity on the animals’ immune systems, muscles and bones, information that scientists compare to the condition of a control group of mice kept on Earth. 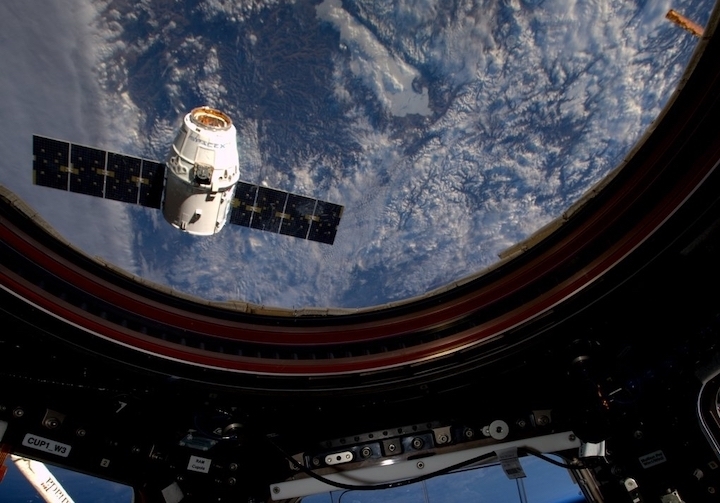 Twenty of the mice were expected to travel back to Earth aboard the Dragon capsule Sunday. Also delivered to the space station aboard Dragon was a scientific investigation to grow protein crystals in microgravity, with the aim to help researchers understand how an antioxidant protein helps protect the human body from oxidizing radiation. Scientists also sent up experiments to study the causes of muscle abnormalities observed in spaceflight, and to examine the corrosion of carbon steel materials in space. In addition to the biological experiments stowed inside the Dragon’s internal compartment, the spaceship’s rear cargo bay contained a pair of NASA payloads that were mounted outside the space station by the robotic arm. One will demonstrate new tools and techniques that could lead to a future capability to refuel satellites with cryogenic propellants in space, and another will scan the planet with a laser to measure the height, density and structure of forest canopies, data that could tell scientists more about the role of forests in the carbon cycle. Once astronauts finished unpacking the fresh supplies, they installed refrigerated samples and other equipment into Dragon spacecraft for return to Earth. Dragon’s return was scheduled for Thursday, but officials pushed back the departure due to bad weather in the splashdown zone in the Pacific Ocean. Managers eventually decided to target Dragon’s return to a different location farther south in the Pacific to take advantage of calmer seas, shifting the cargo freighter’s departure and splashdown from Sunday morning to Sunday night. It was the second nighttime splashdown of a Dragon spacecraft, following a return before dawn in July 2017. But much of the work to retrieve the capsule on that mission occurred in daytime, which a nighttime recovery was planned overnight Sunday into Monday. SpaceX’s Dragon recovery team will hoist the capsule on a boat for the trip back to the Port of Los Angeles, where crews will remove time-sensitive samples from Dragon for return to science labs around the country for analysis. The Dragon capsule that returned to Earth on Sunday night completed its second trip to space after a successful flight to the station in February 2017. SpaceX refurbished the spacecraft for another launch, a practice the company has now followed for five of its resupply missions to the space station. 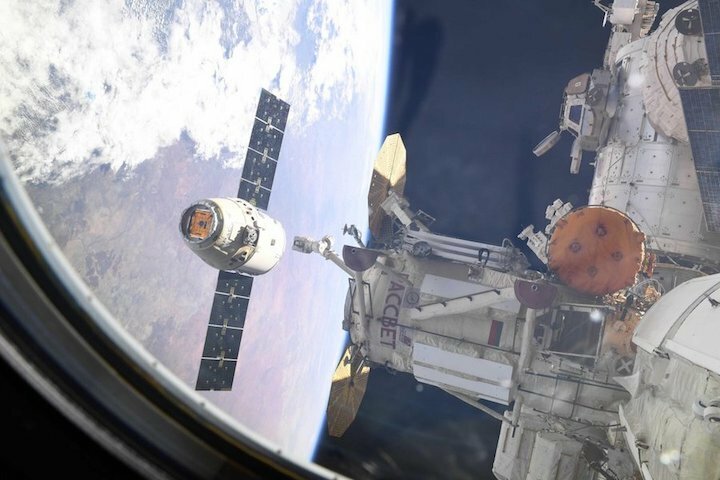 SpaceX’s CRS-16 Dragon spacecraft has concluded the EOM (End Of Mission) phase of her mission following unberthing from the International Space Station (ISS) on Sunday. Dragon’s release from the Space Station Remote Manipulator System (SSRMS) occurred at 23:33 UTC, with splashdown in the Pacific Ocean expected around 05:10 UTC on Monday. The conclusion to Dragon’s mission was expected earlier in the week. However, ISS managers opted to delay the EOM events to Sunday, due to poor weather conditions in the splashdown zone. The CRS-16 Dragon was launched on Falcon 9 B1050.1 back in December. The launch was successful, however the booster failed to land at Cape Canaveral’s LZ-1 due to a grid fin system failure that saw the stage lose control after the entry burn. Despite the spin, the booster still managed to abort to a water landing and was towed back to Port Canaveral a few days later. It is not clear if the booster will fly again, but it’s unlikely it will be refurbished for a customer flight. Elon Musk did intimate it might be used on an internal test flight of some sorts in the future. The capsule contains 1,598 kilograms (3,523 lb) of cargo to be unloaded by the astronauts aboard the space station, while the trunk carries additional payloads for attachment to the outside of the ISS and houses critical vehicle systems including Dragon’s two solar arrays. The capsule is the only part of Dragon that is recovered; the trunk is jettisoned and burns up when it reenters Earth’s atmosphere. Once Dragon arrived at the ISS, the spacecraft provided a multitude of payloads, with pressurized cargo including 304 kilograms (670 lb) of provisions for the crew, 191 kilograms (421 lb) of hardware for the US and international segments of the station and 11 kilograms (24 lb) for the Russian segment, 40 kilograms (88 lb) of computer equipment, 15 kilograms (33 lb) of hardware to support spacewalks and 1,037 kilograms (2,286 lb) of scientific equipment and new experiments. In the Dragon’s Trunk were two payloads to be mounted to the outside of the space station. The Global Ecosystem Dynamics Investigation (GEDI) will use laser ranging to study the three-dimensional structure of features on the Earth’s surface such as forests, snowpacks and glaciers. GEDI consists of a LIDAR instrument which will use the reflection of light pulses to build up a profile of surface elevations. The instrument was mounted on the Exposed Facility (JEM-EF) of the Japanese Experiment Module, Kibo. Ahead of the return trip, Dragon was packed with downmass and the hatch closed. Robotic ground controllers then used the robotic arm to detach Dragon from the Earth-facing port of the Harmony module to maneuver Dragon into the release position. Dragon was released from the SSRMS at 23:33 UTC. Once the LEE snares were released, the SSRMS was backed away from Dragon as the craft held its position at the 10 meter mark. Once the Station’s arm was cleared to a safe distance, Dragon conducted a series of three small thruster firing departure burns that moves the capsule down the R-Bar (Radial Vector) and away from the International Space Station toward Earth (when viewed in relation to ISS orientation and Dragon movements with respect to Earth). As Dragon pushes down the R-Bar, the largest of the three thruster departure burns imparts enough Delta Velocity (Delta-V) change to Dragon to push it outside of the approach ellipsoid. 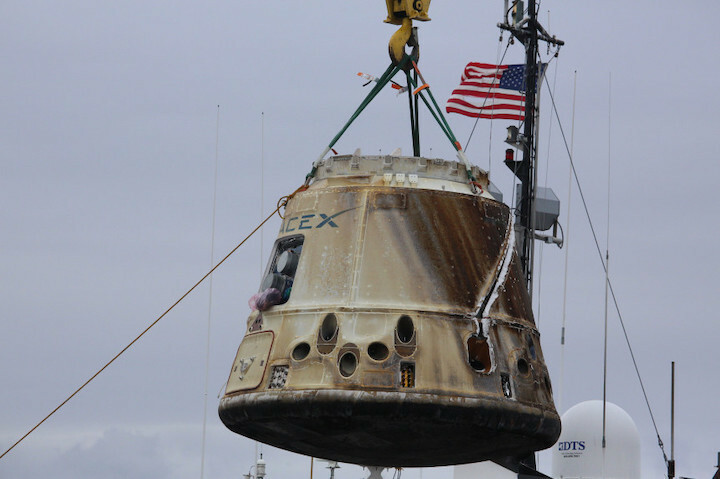 Discolored and scarred by extreme heat, SpaceX’s Dragon cargo capsule returned by ship to the Port of Los Angeles in San Pedro on Tuesday, Jan. 15, a day after splashing down in the Pacific Ocean off the coast of Baja California. The capsule spent five weeks at the International Space Station delivering 5,800 pounds of supplies to astronauts there. t returned to port looking the worse for wear after travelling through roughly 3,000-degree temperatures on re-entering the Earth’s atmosphere. The once gleaming white spacecraft was discolored and charred on one side with black burn streaks like it had been in a fire. 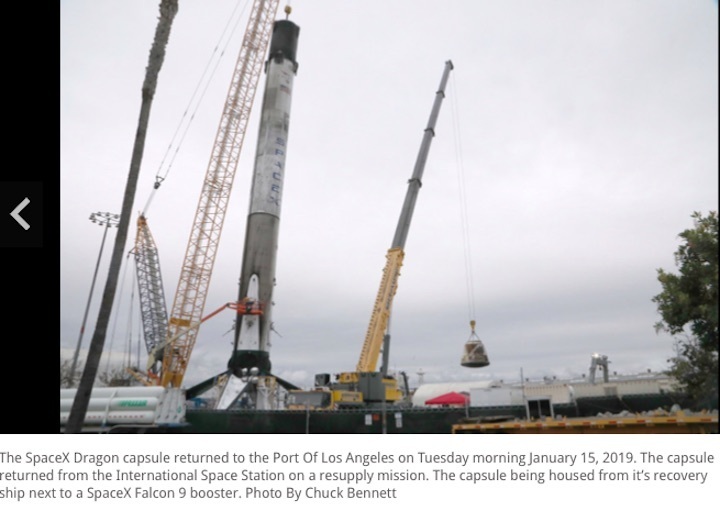 A Falcon 9 booster from a separate launch on Friday, Jan. 11, returned to port on Sunday, Jan. 13. The mission to resupply the ISS was the Hawthorne rocket maker’s 16th of its kind and the first time the capsule was recovered at nighttime. It was also the fourth resupply mission to the ISS using a previously flown capsule for SpaceX led by Elon Musk. The craft was released from the ISS at 3:30 p.m. Sunday, Jan. 13, and splashed down about 9 p.m. Monday, Jan. 14. It launched from Cape Canaveral on board a Falcon 9 rocket on Dec. 5 and arrived at the ISS on Dec. 8. The returning spacecraft carried with it time-sensitive experiments that would be distributed soon among scientists. The next Dragon mission for SpaceX to the ISS will involve its Dragon Crew capsule in an unmanned test launch slated for February. It is with this spacecraft that SpaceX plans to ferry NASA astronauts to the ISS later this year.